March Warmth: Too Little, Too Late? Despite hitting the 50° mark for our Friday and more than likely adding to that total this weekend, this March will go down as a very chilly one overall. Friday marked the first time all month we hit 50°. To put that in perspective, a normal March sees about 10 days of 50° weather. 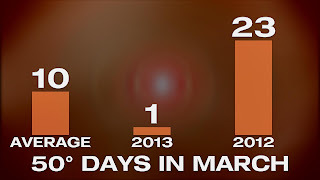 The unusually warm March of 2012 saw 23 days of 50° weather and 10 days where the low didn't drop below 50°! Even with 50s expected for the Easter weekend, that would only put us at three 50° days for the month. The last time we saw that lack of 50° days was 1984, which is the only year we never hit 50° in Rockford. April is expected to start on a cooler note. Let's hope it doesn't turn out like our March did! High pressure overhead Friday afternoon will allow temperatures to rise into the low 50s under mostly sunny skies! Increasing southerly winds ahead of a cold front Saturday will boost temperatures into the mid and possibly upper 50s during the afternoon before rain moves in Saturday evening and overnight. A cold front will move into the Midwest Saturday afternoon with rain likely developing between 3pm and 6pm in northwest Illinois and then spreading east through the evening and overnight. Rainfall amounts will remain on the light side with roughly between a tenth and three tenths of an inch of rain falling by Sunday morning. Cold air will lag behind the first front Sunday so temperatures with a little afternoon sun could rise back close to 50° for the afternoon. Winds will increase from the west as another front, an arctic front, moves down the western Great Lakes. While moisture will remain limited with the second front there may be enough forcing in the atmosphere to allow rain showers to develop after 6pm or 7pm and possibly mix with a few snowflakes by Sunday night as the temperature drops below freezing. It will be a chilly start to the first few days of April but temperatures look to moderate back into the upper 40s and low 50s by the end of next week. The weather leading up to Easter weekend will be nice with mostly sunny skies and temperatures rising into the upper 40s! A storm system passing through the upper Midwest and Great Lakes will pull a cold front through late Saturday night. Winds will increase from the south Saturday helping boost temperatures into the low 50s. Rain, and possibly a thunderstorm or two, will move into northwest Illinois late Saturday afternoon and overspread north-central Illinois during the evening. While there will likely be a few showers early Sunday skies may clear briefly during the afternoon. Winds will stay strong from the west Sunday with temperatures rising back into the upper 40s. A second and stronger cold front will move through Sunday night bringing the cooler weather for the first few days of April. Moisture will remain limited with the second front but there could be a wintry mix late Sunday night into early Monday; especially south of Rockford. 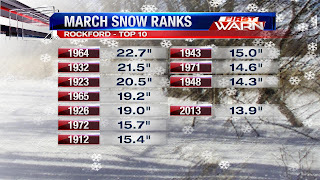 This March is on pace to be the 4th coldest on record for Rockford, which means soil temperatures are plenty cold, as well. There are a few official observation posts across the Stateline, including DeKalb and Freeport. Soil temps as of Tuesday were right around the freezing mark 4-8" below the surface. This isn't unusual, but it is slightly below normal for this time of year. What really makes these numbers incredible are soil temps this time last year. A record warm March in 2012 led to soil temps well into the 50s. Talking to Winnebago County Soil & Water, 50° is the temperature that farmers like to start to planning their crop. This usually doesn't happen until early May. For a full comparison of soil temps between March 2012 and March 2013, click here. For the latest on Illinois soil temps, click here. 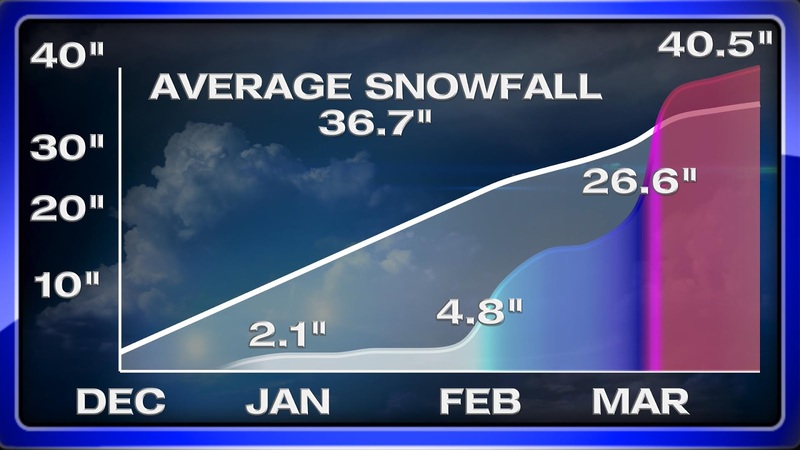 As the snow season begins to wrap up around the Stateline (knock on wood), a quick glance at the numbers doesn't hint at anything unusual, but we all know that statement is far from the truth. Take a look at the timing of our snow this season.We saw virtually no snow through Decemeber and January, the two months that typically see the most accumulation. December saw 2.1" of snow... January saw 2.7". February and March, which historically sees less accumulation, saw the bulk of this season's snow. December 2012: 23rd least snowiest December on record. January 2013: 20th least snowiest December on record. 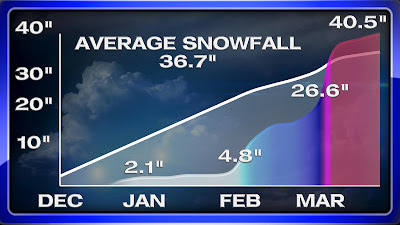 February 2013: Tied for the third snowiest February on record. 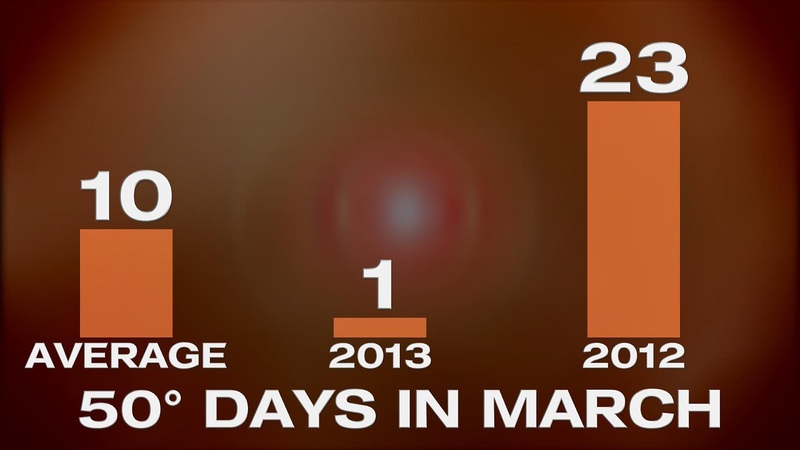 March 2013: On pace to become the 11th snowiest March on record. If you're a weather nut like myself you'll want to mark your calendar for Saturday, April 6th as the annual Fermilab Tornado and Severe Storms Seminar will be held at Fermilab in Batavia at Noon and again at 6pm. Admission is free and the seminar is open to the public. If you plan on attending you'll want to make sure you arrive early as the seats fill up fairly quickly and are on a first come, first served basis. -SuperStorm Sandy, The Largest Atlantic Hurricane and Second Costliest to Hit the U.S.
Dr. Uccellini will discuss the unusual melding of the worst features of a westward moving hurricane and an eastbound Midwest winter storm, Greenland blocking and the tidal effects of a full moon on the east coast. -The Life-Saving Mission of NOAA's Storm Prediction Center: Monitoring Severe Weather Across the U.S. The Storm Prediction Center monitors the threat of severe weather across the U.S. - including here in northern Illinois and southern Wisconsin. This presentation provides a discussion of the current understanding of climate change in the U.S. - looking at severe weather in particular. -Computer Models have Revolutionized Weather Forecasting, but Where Did They Come From? Tom Skilling will discuss the development of the first digital computer at Princeton University in the 1930's and 1940's and its first tasks - Aiding the atomic bomb development and forecasting the weather. Getting critical severe weather information out to the public when severe weather threatens is vital in saving someone's life. However, recent years have showed us that even with that information numerous lives have been lost when warnings were issued well in advance. Why has this happened and how can it be prevented? How can meteorologists at the National Weather Service and in the media clearly communicate the danger which faces a population when severe weather outbreaks occur? Ed Fenelon will discuss the effort to issue what are being referred to as 'impact based' severe weather warnings in attempt to do just that. On April 17th, 1963 one of the most powerful and long-lived tornadoes ever documented in the Chicago area touched down near the town of Essex in Kankakee County. -The History of Skywarn and Storm Spotting in the U.S. Trained spotters are vital to NWS meteorologists and are considered the backbone of the country's tornado and severe weather warning system. They provide invaluable, indispensable and ground-based observations during severe weather. Brian will discuss how the spotter network developed. It may seem like we saw a lot of snow this March, but in the grand scheme of things, it wasn't as impressive as you might think. 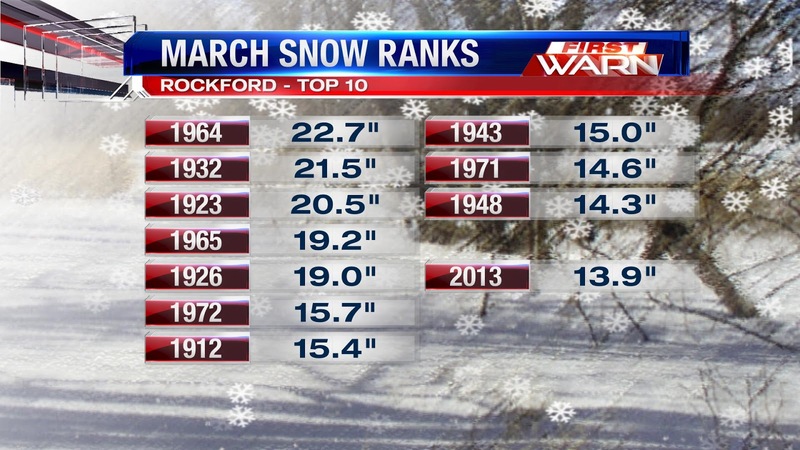 As of Tuesday, Rockford has seen 13.9" of snow for the month of March. On average, March usually sees about 4.8" of the white stuff, making this year much snowier than normal, but 2013 only ranks as the 11th snowiest March on record. Records date back to 1906. And it looks like we'll stay snow-free through the rest of March. With highs in the 50s by this weekend, we're only talking a chance of rain Saturday night and Easter Sunday morning before April officially starts on Monday. The month of March, so far on average, has been 9 degrees cooler than where we should typically be this time of year. With the exception of one day back on the 10th of March, each day has been below average; by almost 20 degrees on some days! However, as the sun shines on this late Tuesday morning things are looking up towards the end of the week and it looks like we'll go into the weekend with near normal temperatures (highs in the low 50s). The blocking pattern over the past few weeks has made it hard for temperatures to rise much past the 30s - let alone rise into the 40s. This pattern will begin to change heading in to the weekend. While we'll continue with the northwest flow in the jetstream, surface temperatures will slowly moderate through weekend as the March sunshine helps to warm surface temperatures closer to average. It does, though, look like we may dip back below average early next week with the passage of a cold front Sunday and Sunday night. Snowfall totals from Sunday evening generally ranged from 1" up to 2" across northern Illinois. Other than a few flurries or light snow showers today any accumulating snow has ended. 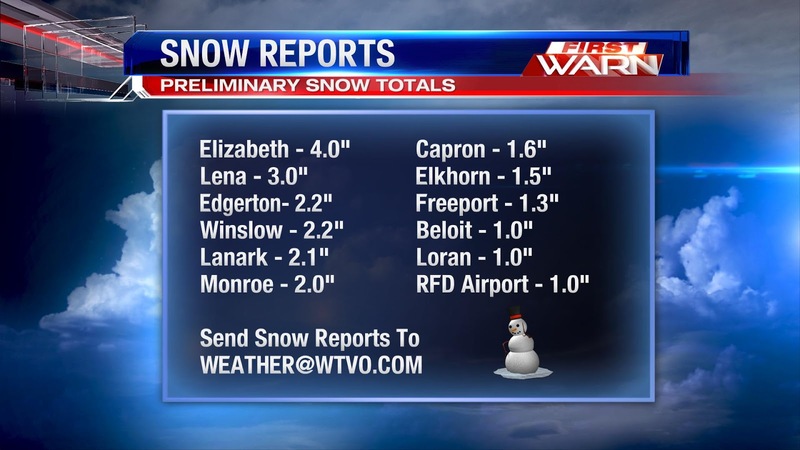 Here are a few snow totals from Sunday evening with updated totals below from this morning. 4:25:23 AM) nwsbot: Local Storm Report by NWS LOT: Rockford [Winnebago Co, IL] official nws obs reports SNOW of M1.9 INCH at 01:00 AM CDT -- storm total. 0.08 of liquid equivalent. 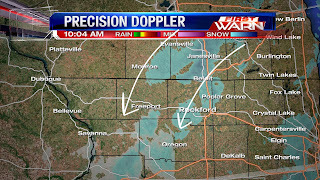 (7:12:34 AM) nwsbot: Local Storm Report by NWS DVN: Galena [Jo Daviess Co, IL] co-op observer reports SNOW of M1.1 INCH at 07:11 AM CDT -- storm total. 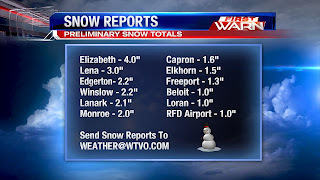 (6:53:24 AM) nwsbot: Local Storm Report by NWS DVN: Freeport [Stephenson Co, IL] trained spotter reports SNOW of M2.6 INCH at 06:22 AM CDT -- 0.7 inches over the past 8hrs. snow depth is 5 inches. (3/24/2013 8:19:09 PM) nwsbot: Local Storm Report by NWS DVN: 3 NNE Stockton [Jo Daviess Co, IL] co-op observer reports SNOW of E2.0 INCH at 08:18 PM CDT -- still lightly snowing. (3/24/2013 8:08:18 PM) nwsbot: Local Storm Report by NWS DVN: Sterling [Whiteside Co, IL] trained spotter reports SNOW of M1.8 INCH at 07:59 PM CDT -- light snow still falling. (3/24/2013 7:30:24 PM) nwsbot: Local Storm Report by NWS DVN: 3 ENE Rock Falls [Whiteside Co, IL] trained spotter reports SNOW of M1.7 INCH at 07:28 PM CDT -- lightly snowing. Scattered light snow showers have developed and will continue to move north to south this morning and afternoon. Accumulations are expected to remain minor but visibility may drop for a time. Roads temperatures this morning are either right at or just below freezing which has allowed any snowfall that may have fallen overnight to accumulate on them possibly leaving a thin layer of ice on them. This will be more of an issue for untreated road surfaces in the open and rural areas. Also, the gusty north wind may cause some drifting on east/west roads this morning which will cause cause roads to become a little slick. Be careful this morning as temperatures will remain below freezing through the majority of the morning. The high temperature Saturday afternoon in Rockford reached 41° making it the warmest temperature we've experienced in almost two weeks! Unfortunately, it still remains roughly 10° below average. We likely won't see the 40's again Sunday as there is a very strong late season winter storm moving across the Plains this evening. Snow has been falling from Colorado, southern Nebraska through Kansas, Missouri and southwest Iowa this evening and will begin to move east through tonight and Sunday. While the heaviest of the snow will fall from Missouri through central Illinois and into Indiana we'll likely squeeze out 1"-2", with isolated amounts possibly near 3" further south by Sunday evening. Winds will also pick up in intensity from the northeast Sunday with gusts topping 30 mph. Lighter amounts will be found north of the Wisconsin/Illinois border with snow amounts increasing the further south you travel. It's officially spring, which begs the question, "Where are the warm temperatures?!" It's going to take at least another week, but if you like warm weather, the long term forecast looks promising. Here's the April temperature outlook from the Climate Prediction Center. It's nothing impressive, but it does hint at a small shot at warmer weather. Just to clarify... the percentages indicate the chance of seeing above normal temps, not how much above average temps will be. Expand that outlook to the next couple months and it's a much different story. If you go April through June, there's now a 40% chance of seeing above normal temps. These outlooks are pretty basic. They don't indicate how hot temperatures would be or when they would happen, but for everyone hoping for some actual spring weather, it's the silver lining on what has been a very chilly March. It's official: The Stateline is officially out of it's drought! 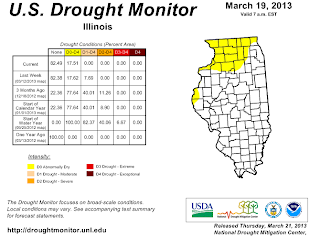 The latest drought monitor from March 19th still shows abnormally dry conditions for northern Illinois, but we have seen big improvements in our dry conditions since last summer. In fact, the last time we weren't considered in a drought was June 2012. The same holds true for Wisconsin. 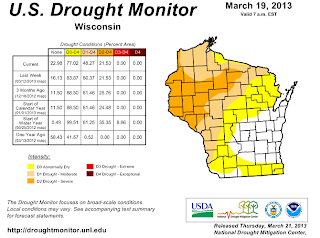 While drought conditions persist to our north, the Stateline portion of Wisconsin is officially out of the drought for the first time since June 2012. This latest drought monitor also marks another achievement. 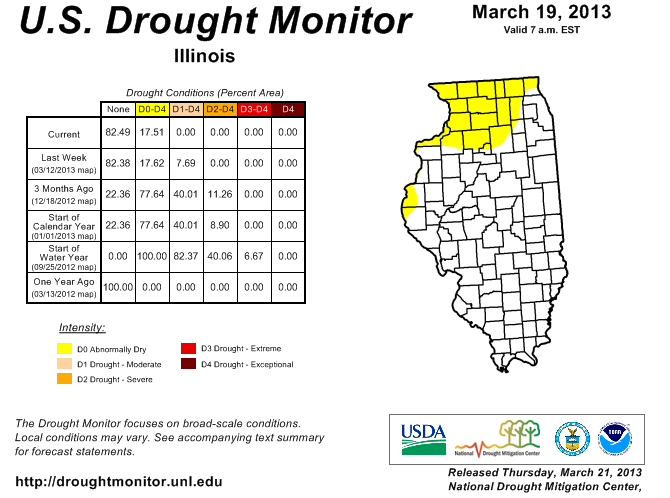 The entire state of Illinois is drought free for the first time since April 2012. With drought conditions done, the question now becomes: Will it last? The Climate Prediction Center thinks so. They are forecasting above normal precipitation for the April-May-June timeframe. The cold air is firmly in place and this will set the stage for a late season winter storm to affect parts of the Midwest and Great Lakes late in the weekend. Low pressure developing east of the Rockies tonight and Saturday will travel east through Oklahoma and Arkansas Saturday and into southern Illinois and Indiana by Sunday. This current storm track would keep the heaviest accumulating snow through Kansas, Nebraska, Missouri, southern Iowa, central Illinois and central Indiana where over half a foot of snow could fall by Sunday night. Winter Storm Watches have already been issued in advance of the storm. Further north, the snow accumulations would begin to taper with possibly a few inches falling in northern Illinois and southern Wisconsin. It's important to note that a slight shift north in the storm track is possible and if that were to occur it would mainly affect the counties just south of Rockford. The storm track likely won't shift too far north due to the negative phase of the NAO (North Atlantic Oscillation) which has kept the cold in place these past several days. Either way, you'll want to keep an eye on the forecast for this weekend should a track shift occur or if you have any travel plans downstate. Thursday morning I sat in on a conference call with the forecasters at the Climate Prediction Center to discuss the release of their 2013 Spring Outlook. The outlook identifies the likelihood of spring flood and a three month expectation (April, May, June) for temperature, precipitation and drought. Numerous factors including the current U.S. snowpack, drought, soil moisture and temperature, streamflow, current precipitation, Pacific Ocean temperatures and various climate forecast models are used to put together the outlook. One forecasters with the Climate Prediction Center stated that U.S. temperatures will likely remain below average through the end of March and possibly even into the first week of April, but there were indications that a possible rapid warm-up may occur after the 5th or 6th of April. This raises some concern for an increase in flooding; especially to the north where a fairly deep, late season snowpack remains. The Red River of the North between eastern North Dakota and northwest Minnesota along with the Souris River in North Dakota have the potential for moderate and major flooding. Also Devils and Stump Lakes in northeast North Dakota have a 50% chance of rising nearly two feet which would flood roughly 20,000 acres of farmland and roadways across the High Plains. Closer to home, the melting of late-season snow to the north may cause minor flooding across the Mississippi River basin which includes parts of southern Wisconsin and northern Illinois. March has been a fairly cold month so the ground in these areas remain frozen which enhances the risk for spring flooding. Above nortmal temperatures this spring (April, May, June) are likely over a vast majority of the United States. Below normal temperatures are possible across the Pacific Northwest and extreme Great Plains. There is a higher probability of experiencing above normal precipitation for much of the Great Lakes; including Wisconsin and Illinois with drier than normal conditions for the west, Rockies, southwest, Texas and expanding across the Gulf Coast. Roughly 51% of the country remains in moderate, or worse, drought. This is an improvement, however, when compared to last year when nearly two thirds of the U.S. were experiencing a moderate or higher drought. 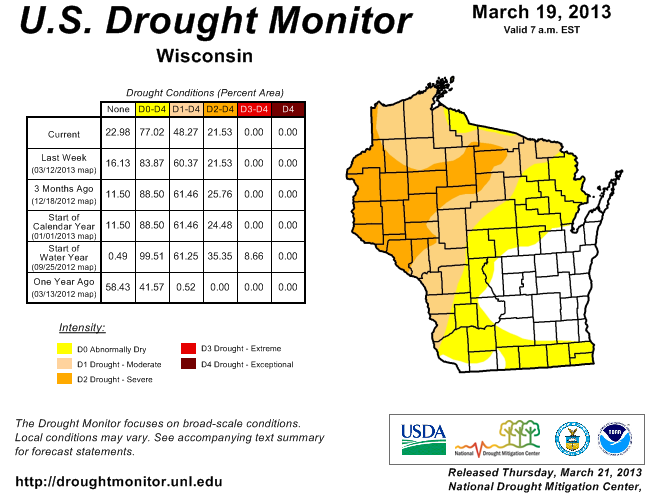 Drought conditions have improved across northern Illinois and southern Wisconsin but drought conditions will continue in California, Southwest, Rockies, Texas and Florida. These are areas that have been hard hit with the drought in recent years. Spring may have started early Wednesday morning but it feels anything but spring-like outside! Temperatures this afternoon will remain on either side of 20° with a slight chance for a few isolated snow showers to develop later this afternoon and evening. Things will remain quiet through the end of the week but the wintry weather may not be over with just yet. Developing low pressure in the Pacific Northwest will move east of the Rockies by Friday with surface low pressure developing near the panhandle of Texas/Oklahoma by Saturday morning. The European model takes this low and zips it across the lower Mississippi River Valley Saturday night and Sunday with it already in the southeast by Monday. Assuming this track holds true any type of snow, or precipitation, would completely bypass us with reinforcing cold air by early next week. The GFS, on the other hand, has the same surface low developing late Friday night but tracking further northeast from the panhandle of Oklahoma/Texas through Arkansas Saturday night and into Central Illinois by Sunday morning. If this track were to happen the thermal profile throughout the atmosphere would support snow...and a lot of it. The European model has had a better track record for handling long range storm systems so my initial thought would be to side with a slightly southern storm track Saturday night through Monday morning. Do I think we'll remain completely dry this weekend? No, I do believe we'll see some sort of precipitation Sunday and Monday. Now whether or not it's all snow or a mixture of rain and snow is yet to be seen. There still remains over a foot of snow to the north across the upper Great Lakes and Northern Plains. During this time of year, the transition months, wind direction makes a big difference. 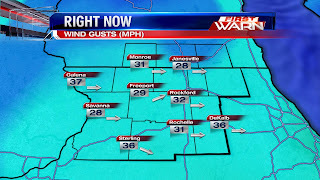 As long as we keep with a north or northwest wind we'll continue with the chill across the Stateline. 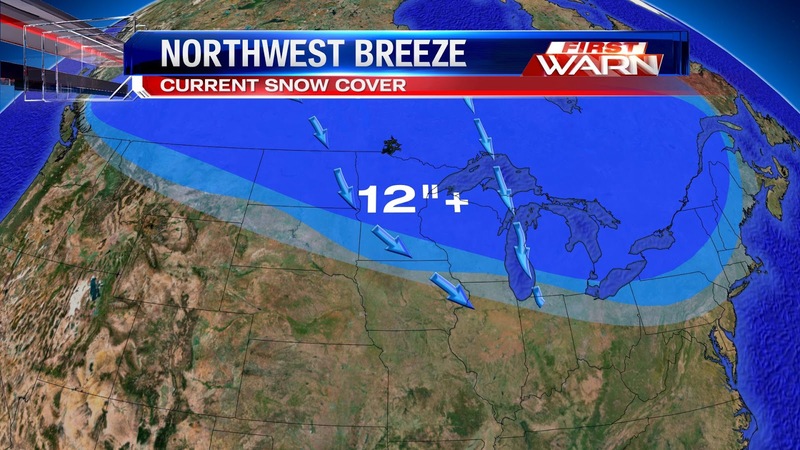 As the snow pack dwindles within the next several weeks a northwest breeze won't be quite as cold. But until then temperatures the next few days will remain well below average. Unfortunately it looks like the northwest wind continue through the end of the week. Negative NAO & AO: What does it mean for our weather? It's not just the weather around us that drives our temperatures. We have to look at patterns at large scale or global level to fully understand our weather. Two of the products that we look at to assist us are the North Atlantic Oscillation (NAO) and Arctic Oscillation (AO) forecasts put out by the Climate Prediction Center (CPC) in the National Weather Service. We'll first take a look at the North Atlantic Oscillation. The NAO is located in the North Atlantic Ocean near Greenland and we usually look at how it impacts our weather during the winter months. The black line on this chart shows us observed data for the NAO. Currently, it is negative and has been that way for nearly a week. What this tells us is that we are in a blocking pattern thanks to an area of high pressure sitting near Greenland that isn't moving. This causes a trough to form over the eastern half of the United States that can't move anywhere thanks to the blocking from the high pressure near Greenland. For us it means cold temperatures, as this trough will pull in cold air from Canada. What's real impressive about this cold air sitting over the area is that it originated from around 60°N. To put that in perspective, the Artic Circle is located at 66°N. That is some really cold air. Looking back at the NAO map, we'll look at the forecasts. These are the red lines on the right side of the chart, with each individual line being a different model run trying to project what the NAO will do. When you see all of the lines bunched together, we have a very high confidence in the forecast. Right now it looks like this blocking pattern should hang around for a few more days at least, keeping the cold air in our area. As we look farther out into the future, there is a lot of uncertainty whether we are going to warm up a little or stay cold. That comes from the wider spread in each model run. When we look at the forecast put out by the CPC for the Arctic Oscillation, we apply basically the same concepts to understand it. The big difference is the loaction of the AO, which originates just south of the Arctic Circle in Central Canada. The observed data for the AO is really negative which again will mean an area of high pressure. The difference this time is that it is helping to drive the trough over us to the south, which is sending that cold air right to us. The models do seem to agree that we will go less negative, and that the high might try to move off. This could help our temperatures warm up a little. As in the NAO though, there is some uncertainty when we get a few days out. A quick moving storm system Monday brought anywhere between 1" to 4" of snow across Northern Illinois and Southern Wisconsin. Now that the snow has ended the cold has set in and will continue for the next several days. While we were dealing with wintry weather folks in the south and southeast were dealing with severe weather. A strong cold front moving through Louisiana, Mississippi, Alabama and Georgia Monday afternoon brought wind gusts over 70 mph, golf ball sized hail and even a couple tornadoes in central Tennessee. Thankfully there were no reported fatalities, but several people were injured due to the strong winds. Winds have really picked up since late this afternoon, and it will cause several problems during the overnight. Wind gusts as of 10:00pm were still upwards of 30-35mph in many spots. 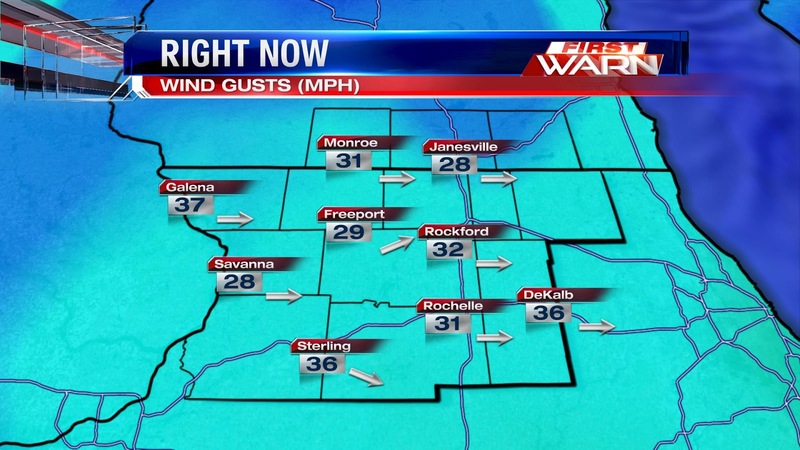 These winds will cause some blowing and drifting snow, especially on north-south roads. Limited visibilities could also result from the blowing snow, so the National Weather Service in Milwaukee has issued a Winter Weather Advisory for southern Wisconsin until 10:00am Tuesday. If you're out on the roads, be aware of road conditions going downhill in a hurry in isolated spots. The bigger concern over the next couple nights will be the wind chills. With strong winds and lows tonight in the low teens, wind chills will be below zero. 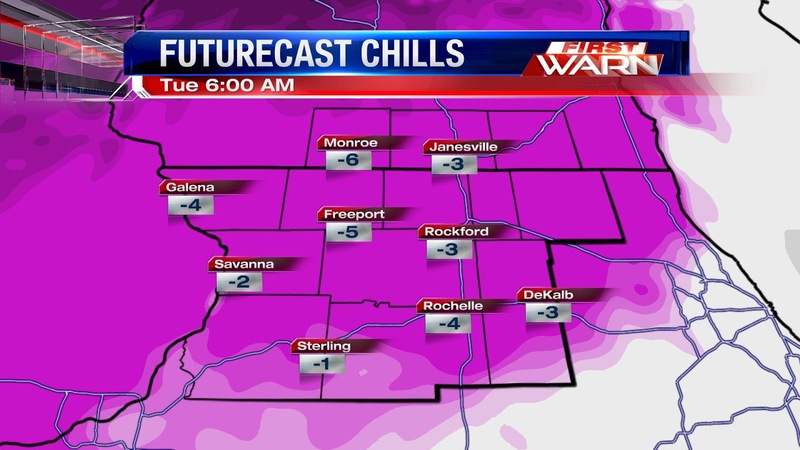 Expect sub-zero wind chills the next couple of nights, as well, as cold air continues to dominate the forecast. As the snow slowly comes to an end this evening a strong northwest/west wind will grip the Stateline. The low pressure system that brought us the snow Monday will lift northeast into the New England states and remain parked there for the next several days. At the same time cold Canadian high pressure will slide down the Plains pulling down with it some very unseasonably cold air. Both the high and low pressure systems will be strong and the difference in pressure between the two will help create the strong wind we'll feel later tonight and tomorrow. The image of the left shows lines of equal sea level pressure. The closer the lines are to each other the strong the wind. The further apart the lines are the lighter the wind. Wind gusts tonight will near 30 mph and top 40 mph Tuesday afternoon. Strong winds will continue Wednesday before the low in the east moves into the North Atlantic. Temperatures tonight will drop into the teens behind a very strong cold front and only rise into the upper 20s to near 30° by Tuesday afternoon. 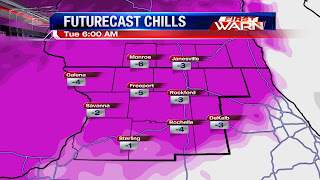 Wind chills will stay in the single digits Tuesday and drop below zero by Tuesday night! 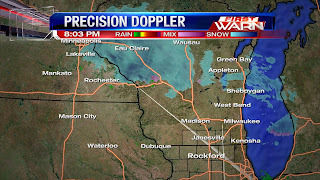 (12:38:50 PM) nwsbot: Local Storm Report by NWS MKX: Elkhorn [Walworth Co, WI] public reports SNOW of M1.5 INCH at 12:30 PM CDT -- relayed by media. (11:24:19 AM) nwsbot: Local Storm Report by NWS LOT: Capron [Boone Co, IL] trained spotter reports SNOW of M1.2 INCH at 11:19 AM CDT -- snow fell between 6 and 11 am. (11:20:58 AM) nwsbot: Local Storm Report by NWS LOT: Capron [Boone Co, IL] trained spotter reports SNOW of M0.6 INCH at 11:19 AM CDT -- snow fell between 6 and 11 am. (10:32:16 AM) nwsbot: Local Storm Report by NWS MKX: Monroe [Green Co, WI] law enforcement reports SNOW of E2.0 INCH at 10:30 AM CDT -- numerous accidents across the county. 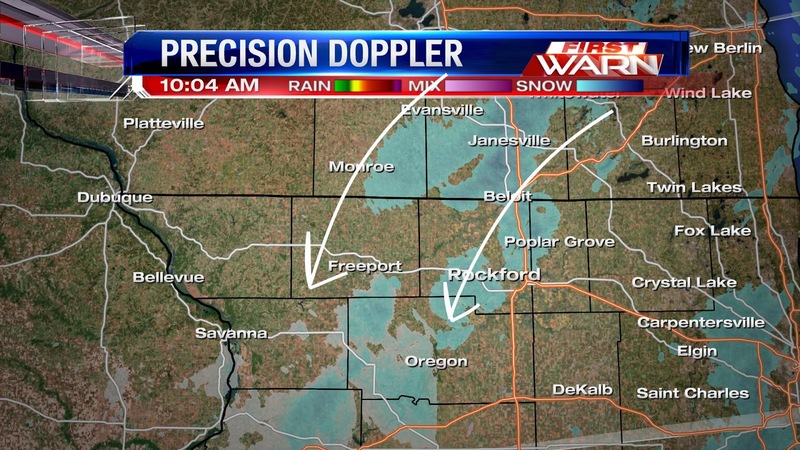 10:25 am Update: Moderate snow falling in Rockford with the visibility dropping less than two miles and less than a mile in Freeport and Monroe. Heavier snowfall west this morning produce 2" of snow in western Stephenson County. The snow will lighten up around Noon before another round of heavier snow moves in mid-afternoon. 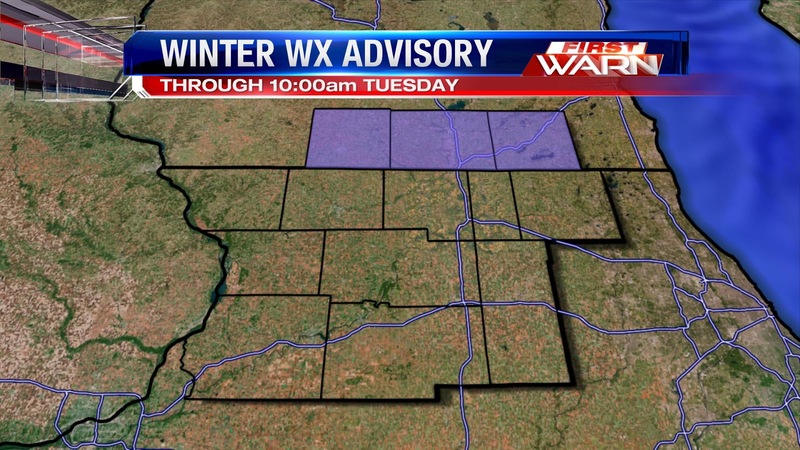 9:30 am Update: Light to moderate snow will across Northern Illinois and Southern Wisconsin. A little drier air has been lifting north so it's possible there may be some sleet or even freezing rain mixing with the light snow from Rochelle to DeKalb and points south through late morning before snow rotates back through early this afternoon. 8:20am Radar Update: Moderate snow continues to fall this morning with a heavier band extending from Janesville/Beloit southwest to Pearl City. Within these heavier snow bands visibility has dropped to less than half a mile. Roads have become a little slick as temperatures remain below freezing. Accumulations between 1" to 2" of snow remain likely. 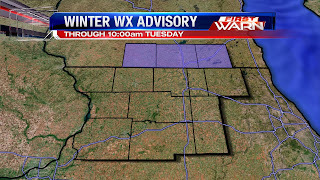 A Winter Weather Advisory has been issued for Winnebago, Boone, McHenry, Ogle, Lee and DeKalb counties until 11am this morning. Two systems - one from the south and one from the west - will impact us this morning and afternoon. 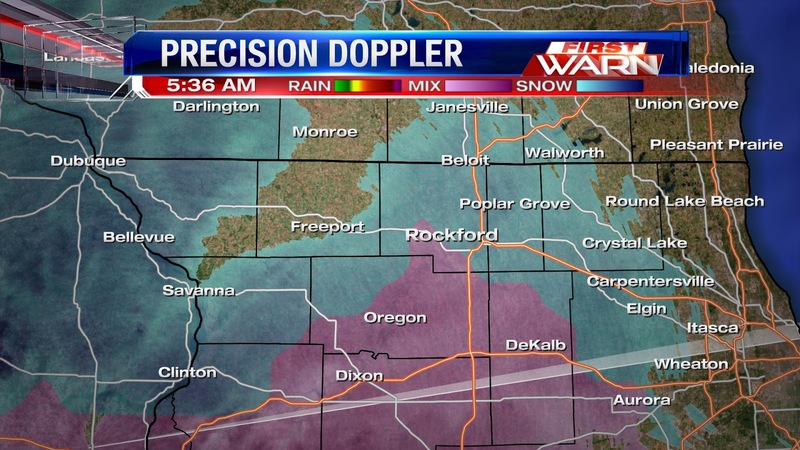 Light to moderate snow has already begun to fall and is mixing with sleet south of Rockford. A quick one to two inches of snow/sleet accumulation on grassy and elevated surfaces will be possible before the snow winds down by mid-afternoon. As the snow continues to fall there may be some slick spots on roadways this morning. I think Mother Nature needs to realize that spring is right around the corner and warmer temperatures would be much appreciated! Unfortunately, the late March chill looks to stick around through the end of next week and possibly even through the last week of March! Low pressure will swing through the upper Midwest late Sunday night and pass north of the Stateline Monday afternoon bringing with it a quick inch or two of snow by Monday night. Temperatures will drop behind a strong cold front Monday night with highs Tuesday, Wednesday and Thursday only in the low 30s! Average highs this time of year should be in the upper 40s/low 50s and some will struggle to even break 30° Wednesday afternoon. It's possible we may not reach 50° until sometime in April! We're not seeing a break in the weather just yet. Afternoon a round of afternoon showers and evening fog, falling overnight temps will give us the chance for a wintery mix heading into Saturday morning. 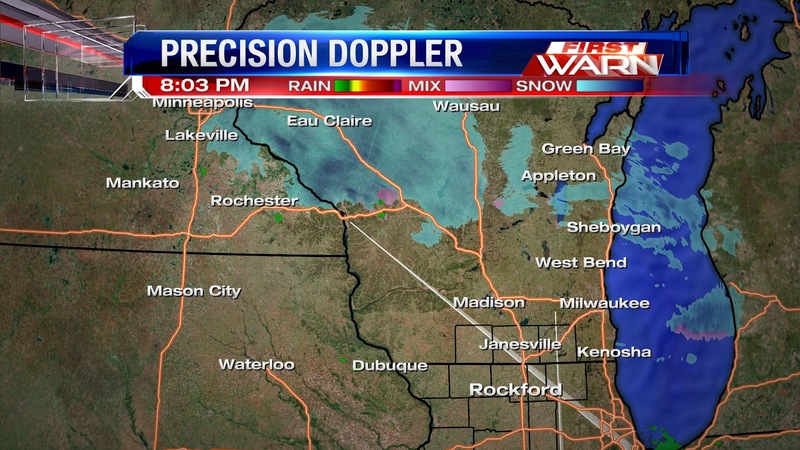 Precision Doppler just after 8:00pm is showing snow showers into central Wisconsin. 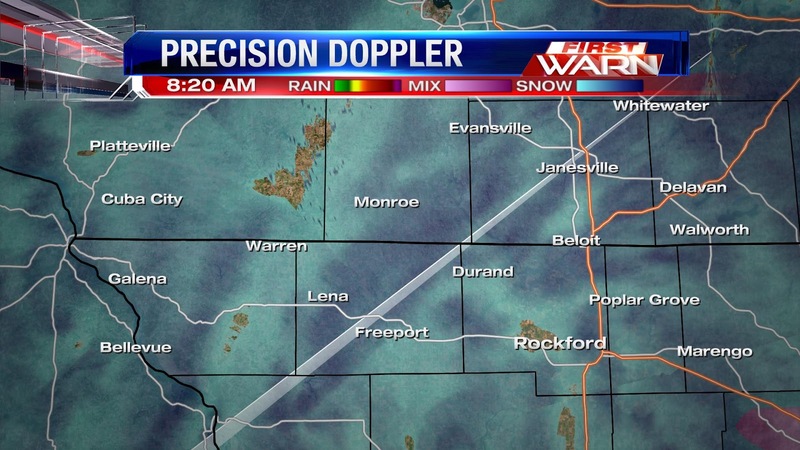 As that snow begins to push into Stateline, it will encounter temps that are right around the freezing mark. 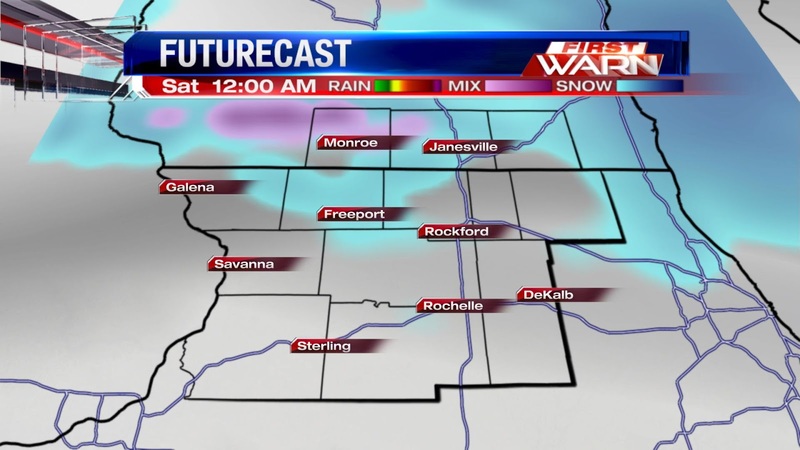 Futurecast showing most of this rain & snow mix holding off until around midnight. Depending on where temps are, we could see a little freezing drizzle mixing in with our snow before we see a complete switchover to light snow for the overnight. We should be fairly dry by Saturday morning. Fortunately, snow won't amount to much. Looks like a dusting will be our worst case scenario heading into the St. Patrick's Day weekend. 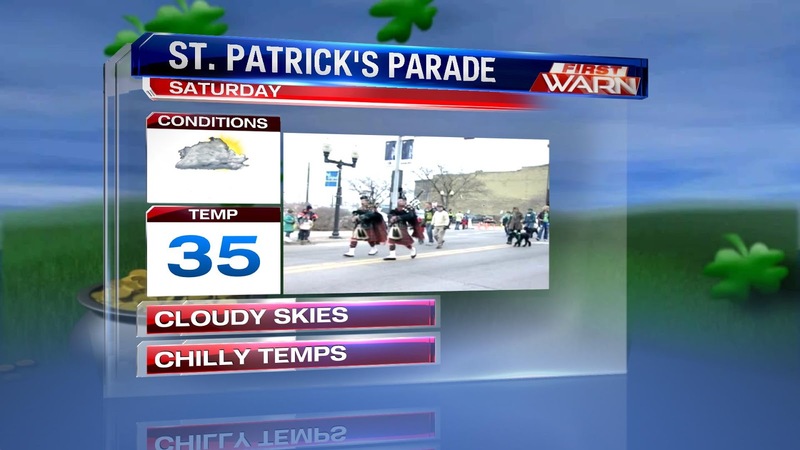 Speaking of St. Patrick's, if you're heading out to the parade in Rockford Saturday afternoon, bundle up! We'll be dry, but cloudy, with temps in the mid 30s. Free Storm Spotter Classes Coming Up!